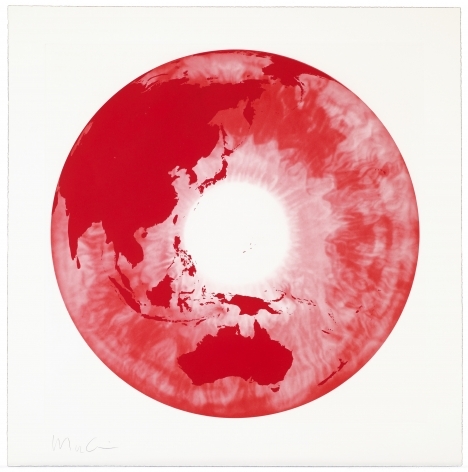 Marc Quinn was born in London in 1964. He studied art history at Cambridge University in the 1980s while working as Barry Flanagan’s assistant. 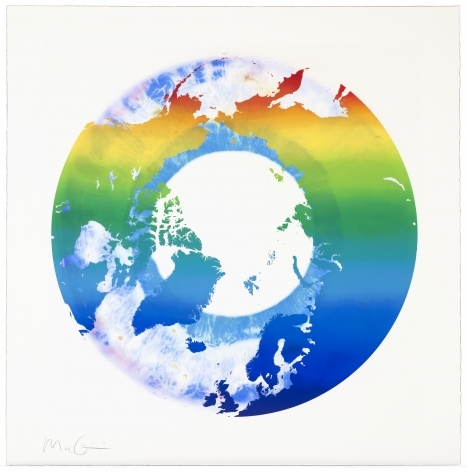 In Marc Quinn’s world, life competes with artificial plastic. 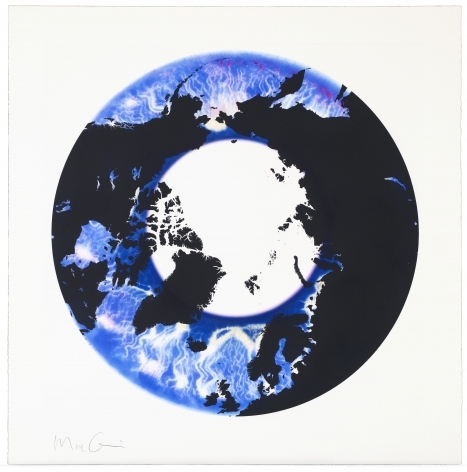 Playing on the traditions of our visual education, Marc Quinn underlines the delta between myth and reality. His work often draws together philosophy and existential thought. 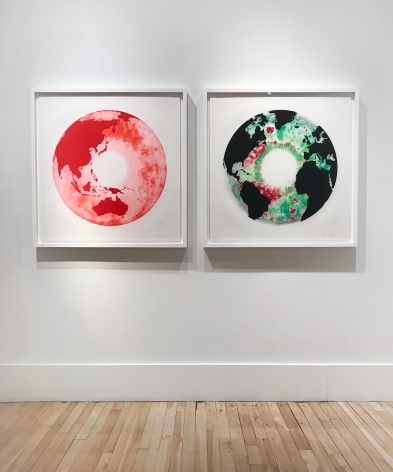 Marc Quinn believes this is the conflict between the natural and the cultural life within our body, two leitmotivs of our day and age. These are explored through mortality, beauty, the crystallization of a moment in time and space, through the interplay of art and science. The artist is fascinated with questions regarding genetic mutation and hybridism. 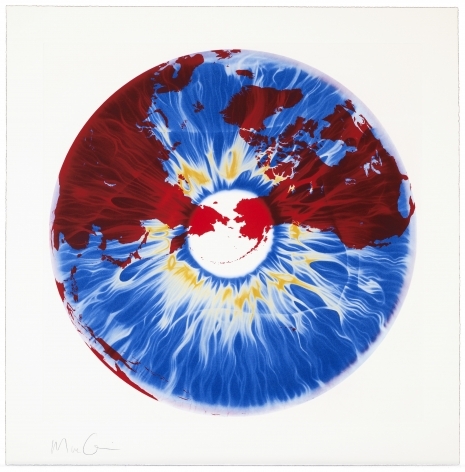 Marc Quinn’s work ranges across a variety of media – from sculpture to painting, drawing and photography exploring various means of expression, from blood to gold. His first solo exhibition was held in 1988 at Jay Jopling/Otis Gallery in London. 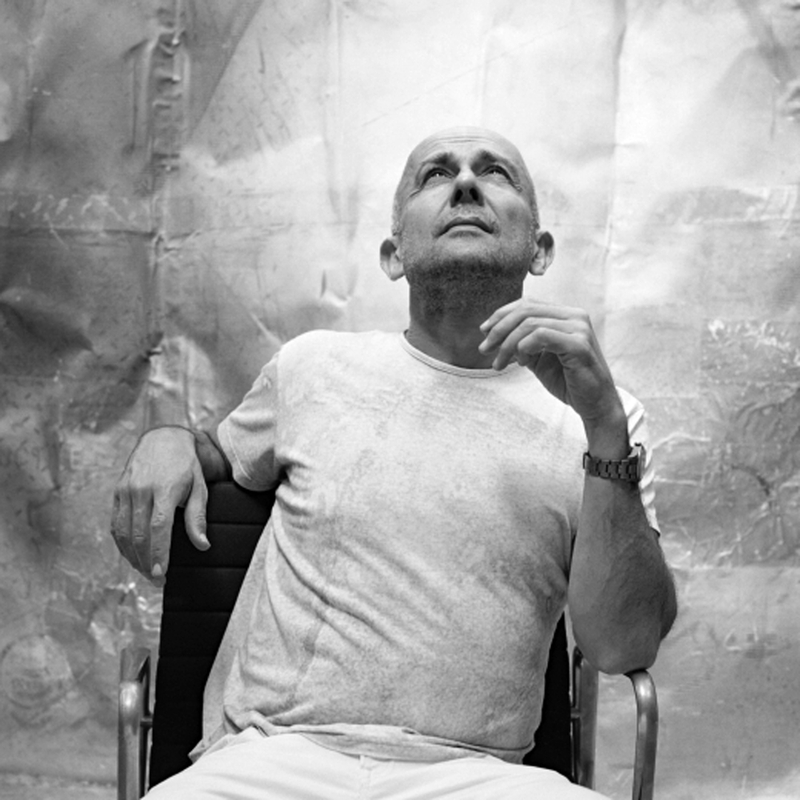 Marc Quinn lives and works in London. The Iris paintings reflect the fact that, in the age of the internet, the visual sense dominates our perception of the world. The eye is traditionally seen as a mirror of the soul but it is also a microscopic map of an individual's identity, since each person's is unique. In these works, Quinn depicts an iris at close range, in a photorealist, non-expressive way on a round canvas. The eye is enlarged so that it appears virtually abstract and the pupil appears like an aperture or hole in the centre of a fine, detailed network of colourful lines. Quinn was interested in the idea of making ‘stealth’ portraits of people, at once universal and unique, and not just an image of the sitter, but an actual visual index of their identity. The artist observes: "The etymology of 'iris' is derived from the Greek word for 'rainbow'. And in the colours, even in quite subtle, dark colours, there is a kind of celebration of individuality." Furthermore, "in the middle you have that black hole of the pupil [and] all of the mystery and uncertainty of life. It’s a very profound expression of the ambiguity which is at the heart of our existence." 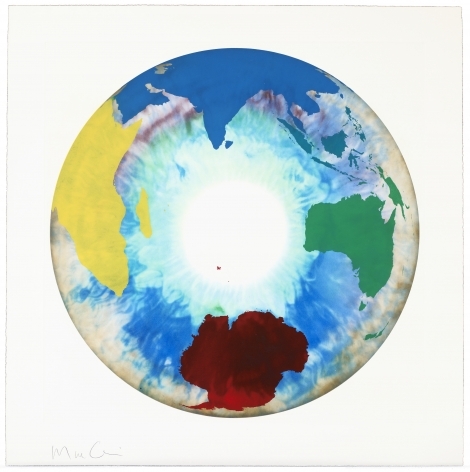 Also of interest about the eye is its position as the only internal organ you can see from the outside, as Marc Quinn remarks: "The iris is in a way our doorway to the world, it is the window we see out of and the doorway for light to enter and interact with our nervous system. They are like a leakage of the vivid interior world of the body to the monochrome world of the skin. 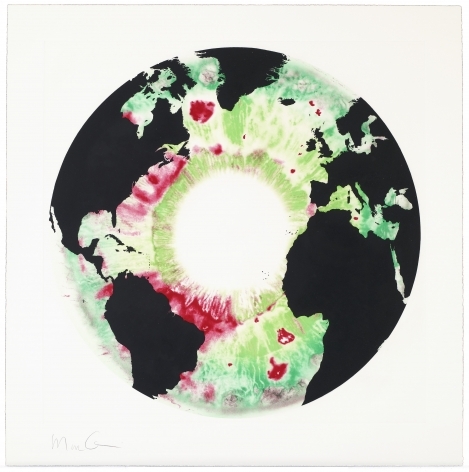 In the works Map of Where You Can't See the Stars and Eye of History, Marc Quinn has added a world map over the image of the eye. 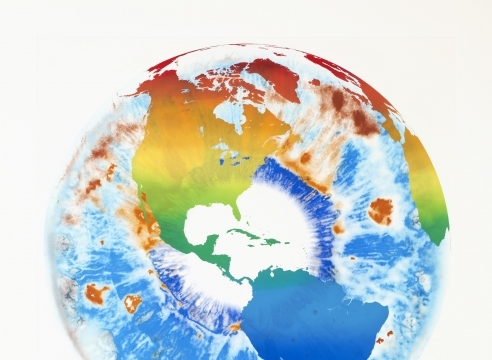 These works comment on the paranoid world we live in, and the notion of 24-hour news where the whole world is connected through ever-present media and syncopate this with notions of our eroding and changing geographical world. 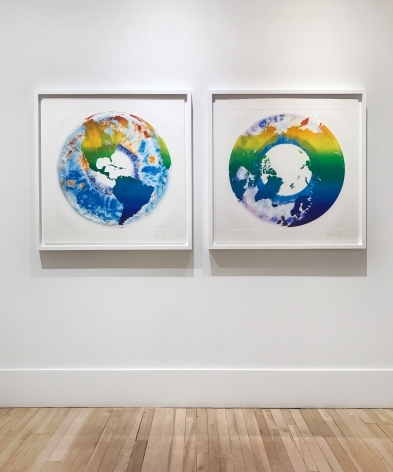 They present images of the world map from various perspectives – such as the Arctic – displaying how the boundaries of experience and geographical territory as we know them are rapidly changing. 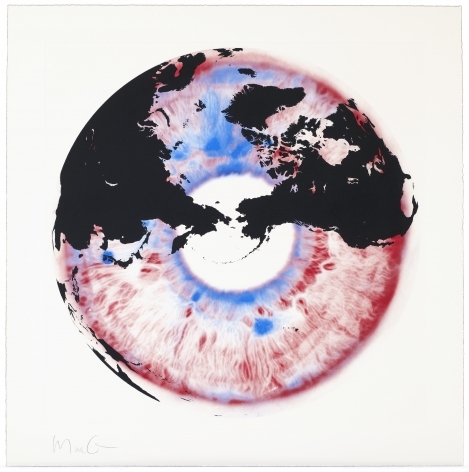 UK artist Marc Quinn explores the relationship between art and science. In this series of oil paintings entitled "The Eye of History" he explores the perception of beauty. Each individual has different markings on their eyes, much like a fingerprint. Marc has blended the eye's fingerprint with the fingerprint of our planet to create one seamless image. 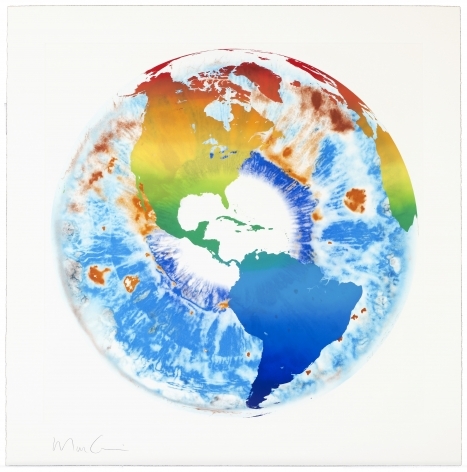 Marc pushes boundaries in all of his works in exploration of our world and its population.